God is so good. SO GOOD. He continues to bring faithful believers and supporters to my side. Day by day God is fulfilling His promise to get me to San Salvador and do great, big things in and through me. These are the awesome people who have come alongside me in my journey to San Salvador! Please pray and thank God for them as they give sacrificially towards God’s work in San Salvador! GOD IS SO GOOD! He provided me with my very first financial supporters!!! Rachel and Matthew will forever be a part of my story! It is truly a sign from God that exactly a year ago today I stood in the center a Salvadoran high school and heard Him whisper in my heart that He has work for me to do in San Salvador! Blessings on Blessings!!! Welcome to the familia, Becky! Kristen has been my best friend since 2003! She immediately became family! Her husband Trai joined the FUN in 2011! Michelle has been my girl at Phia Salon for TEN YEARS now! So I’ve decided that she is going to have to make regular trips to San Salvador to cut my hair. Abby began supporting me when moving to San Salvador was a mere call from God. Now she has joined mi familia and is part of the dream! My main hombre Marty Mar joined Team Ashley! I’m so excited to know that Marty will be reaching out to the CBus urban youth while I’m reaching Salvadoran youth. God is so COOL! God is good and so is Bueno! Even at 7:30 in the morning! It was really awesome sharing my vision of God’s work through me with someone who knows and loves the Salvadorans like I do. Welcome to la familia, Bueno! Frank is a teacher at Upper Arlington, my old high school! I never actually had him as a teacher, but we’ve run into each other through mutual friends the past few years. Mr. Tuttle understands kids and he sees God’s vision in San Salvador! Having Emily on my team brings a big smile to my face and a tear of joy to my eye knowing that God is blessing this journey through friends like her. “Wow, I am so very impressed with your mission work. You are an amazing person, but I honestly realized that when you when in the 1st Grade 24 years ago. So very, very proud of you! Take care and God bless you.” – Mr. Scarpitti, my elementary school principal. There are no words. Thank you. You marked my heart 24 years ago and you have done it again. 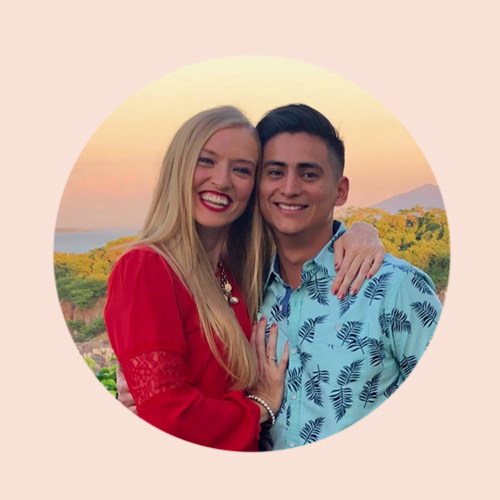 Jamie and Michael have a little one on the way and now they will have a crew of Salvadorans to take up space in their hearts! They weren’t kidding when they said “Sisters are for Life!” I love how God brought us together years ago on Ohio University’s campus and He did it again, now states apart! Julie has been one of my greatest supporters since the beginning – Since before the beginning, actually! Around April of last year, Julie and I discussed my feelings of not having a purpose in life and just feeling quite lost. A few weeks after that, we met again and Julie was quite certain that I would find some clarity to my life’s direction in San Salvador. And, as they say, the rest is history, my friends. I am so encouraged to call Julie and Seven Studios some of my kindest friends. Oh my goodness. There is only laughing and smiling when I am with Alisa! Her friendship is the sprinkles on my ice cream cone of life! I’m so glad to call her my sister!! my’s heart for missions is contagious! I love sitting with her and sharing our love for Central America. Amy left part of her heart in Honduras, but I know it won’t be long until I see her in San Salvador!! Deedee’s smiles are heart warming and contagious! Her heart of gold has led her to send her love through me to San Salvador! I met Lauren in San Salvador last August. Our churches were both on mission trips. I could immediately tell she had a giant heart for the children of San Salvador. Now, with her support, I get to share that love with all the people of San Salvador! A little over a year ago, Annie and I were in San Salvador together on a 9-day mission trip and I DROVE HER CRAZY. Loca. After I was finally able to open my heart to my mission team, she saw the real me and quickly became one of my best friends. Since then, she has been my biggest supporter and a wonderful mentor. Jasmine (aka Jazzy J) was one of my roommates during the August 2014 mission trip to San Salvador. I was blessed because of the amount of laughter and joy I shared with this girl! Mrs. Donovan was my 1st grade teacher waaaaaay back when! When we met yesterday, she told me that she knew from my young age that I had an adventurous spirit! Apparently I needed to learn to tame my adventuresome side! Donna supported my life journey then and she is supporting me again!! Connie has been a dear friend for years and years. In high school, I played ultimate frisbee with her oldest son, her middle kid was my first (and only!) high school boyfriend and her youngest, Alissa, is fellow Depp-a-Thon VIP! Through it all, Connie has been so kindhearted and encouraging. I am blessed to have her and her husband Phil by my side for this new adventure! Robin and her family were part of my neighborhood, Teeway Drive, family for years growing up. Memories of swimming in their pool, playing dress up with her daughter, Sydnee and laughing for hours on end will forever fill my heart. Thank you for your love and support! In the past 7 months, God has opened door after door, showing me that youth ministry in San Salvador is His call for my life. On Wednesday morning, God used Tom to show me once again that I’m on the right path. I had never met Tom before Wednesday morning. He is a friend of a friend who thought he’d be excited to hear what God is doing in San Salvador. I took a step of faith, shared my vision with Tom and asked him to join my team. Without hesitation, he agreed. Wow. This is a HUGE deal because Tom doesn’t know me and yet trusts that God will work through me in San Salvador. He believes in my vision enough to support me, practically a stranger, with his hard earned money. That is definitely a sign. Thank you God & thank you Tom. I have a lot to learn from this beautiful girl and her heart of gold! It is a privilege to work beside her in Rock City Youth. I have been so fortunate to be surrounded by women who embody the person I aim to become one day as a wife, mother and woman of God. Barb is all of of those things. She loves her husband and kids with all that she has, is always working to grow closer to God’s heart and DANG can that woman bake a delicious dessert!!!! // side note // it has been a true gift to hang out with Barb’s daughter Annie at Rock City Youth! Annie’s smile, laugh and joy for Jesus is absolutely contagious! God placed these 2 girls in my life as my best friends 16 years ago for a reason. He knew that I would need a solid foundation of love and support to draw on after years of trying to do things my own way. All these years later, Emily and Brittany have stuck by my side and continue to love and support me. It brings a great smile to my face and a giggle in my heart to think of all we have come through together and yet made it out on the other side – together. “Well OBVIOUSLY I am going to support you!” Folks, none of this is obvious to me! I go into each meeting hoping for encouragement and prayers. When someone tells me that they want to support me above and beyond prayers, it is a joyful and beautiful moment! I don’t take any of this for granted and truly appreciate all the love that has come my way – in all its forms! These weirdos have been an incredible blessing to my Salvadoran journey! Nicole’s first words to me after she and Josh returned from San Salvador in March were, “NOW I get it. I know why you have to go there.” I love it when people get it. Meet Lord Business! Jack is a number crunching, youth leading, world traveler with a heart for youth missions in San Salvador! Oh Callie. What a wonderful soul. I am blessed each day that I get to spend with her. She loves people the world over and is a constant encouragement as I take my love to San Salvador! There is no doubt that Sylvia’s heart beats for San Salvador. I am so eager for the day when she comes to visit and I get to greet her on the Salvadoran side! I have known Jon for years and he is a constant source of smiles and support. I am so excited to share this experience with him! Kayla and Nicholas have been on this journey with me since almost the beginning! They have offered up prayers, hosted jewelry parties, and are now part of my support team! I had the joy of experiencing San Salvador with Annie last August! Watching her work with the kids at the CDI was my first chance to see her heart for service. And now she is serving San Salvador from afar by helping to send me there! God has a plan for this young woman! It is inspirational to see how she trusts God to lead her life. Lauren has been to San Salvador and back and now is helping to send me there! As I prepare to follow God to San Salvador, Ray is following Him to Abu Dhabi! He will be teaching kids in the classroom and I will be working with them through the youth ministry! I am so excited to see how God uses both of us to work in the hearts of kids around the world.